Movies will be reviewed when they are seen, which is to say no particular order at all. I’m by no means a movie critic, but watch a lot of movies and I’ll discuss those pertinent to the site. 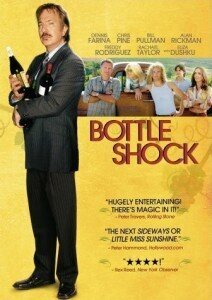 I was somewhat surprised that Bottle Shock didn’t rate highly on Rotten Tomatoes (48%). But a lot of the rotten reviews focused on comparing it to Sideways, the other semi-popular wine movie of the 2000s. Sideways was an awesome study of men, relationships, character, and why Pinot Noir is superior Merlot, as Miles would have you believe. There was even speculation that the “Sideways Effect” affected American consumer preferences. So Bottle Shock wasn’t Sideways, but there was an intriguing story: how California’s Napa Valley got on the worldwide “map” as a region for premier wine. I’m sure there were some artistic liberties taken, but the competition in Paris seemed to be the tipping point for California wine. Beyond the Chateau Montelena’s Chardonnay, the other winner from the competition was the eponymous Stag’s Leap Wineries (founded 1972), its region now widely recognized as producing premier Cabernet Sauvignon. The best actor was Bill Pullman, playing the ascetic owner of Chateau Montelena. The rest of the actors were marginal, with the exception of Alan Rickman, who may or not have been overacting. I was left wondering what happened to Gustavo’s character: first he makes an unbelievable wine, but gets into a fight with his employer and suddenly he and his wine become marginalized. Apparently, it’s because the real Gustavo didn’t appear on the vineyard until after the story’s timeline so Gustavo was a real person whose story was made up and thus the screenwriter forgot to put any closure on his character. Its probably not a good idea when the protagonist is an entity (a vineyard) and none of its members are likable. It’s like making a movie about Duke winning a basketball championship. The Parisian shop owner and organizer of the climactic competition was named Steven Spurrier. I was really confused in the movie’s opening minutes wondering when and why coach Steve Spurrier owned a wine shop in Paris. Chateau Montelena seems like a neat place to visit. Next time I’m in Napa, I’ll stay in Calistoga and will check it out. Conclusion: Recommended with reservations. If you’re into wine, it’s pretty awesome. If you’re just a movie buff, it’s a pass. After writing this, the 48% seems a bit more justified.